It seems with all the systems we have today to generate, score, and nurture leads, it all comes down to sales. The amount of time it takes for a sales person to follow up with a lead can determine whether the deal is closed or not. At least, that’s what the recent HBR article “The Short Life of Online Sales Leads” states, saying that 24% of companies take more than 24 hours to respond to a lead, and 23% of companies never responded at all. According to their research, the average response time, among companies that responded within 30 days, was 42 hours. The article doesn’t go into much detail about whether the leads being followed up had been nurtured by a Marketing Automation system, or even a break down of industries but it does point a good possible flaw in the sales process of most companies. What good is implementing a complex nurturing system if when the marketing qualified lead is sent to sales, the rep doesn’t follow up? 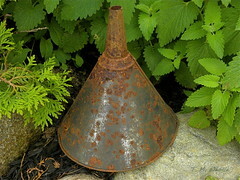 Plugging this hole in the funnel takes more than software. The numbers above should be enough for you to go back to your own metrics and see how you compare. Sure, depending on your industry the numbers might be skewed but at least you have a benchmark and something to show (or not!) senior management when your results are being questioned. The report goes a bit further and also tells us that 52% of all registrations occur within 10 days before a scheduled webinar and 15% registering on the day of the webcast. In my experience this is accurate, and sometimes during the day (or the day before) of the event tends to bring an increasing number of new registrations. We are all procrastinators it seems when it comes to registering for online events. What’s the ROI of webcasting? According to the survey webcasts have a $22.60 cost per registrant for those with an average of 441 registrants and $39 per participant if the average is 256 participants. I personally think these numbers are high, but it depends heavily on the webinar platform you’re using. On24 is not the lowest priced one on the market (Adobe Connect, WebEx, and GoToWebinar all charge less for webinars), but this should be easy enough for you to calculate for your specific situation. Oh, but note that the cost involves “audience generation programs, to produce and promote a webcast”, so you have to add your email marketing costs (again, different platforms will charge differently) and any additional method you typically use to get people to register and attend. I encourage you to download the FREE report from On24 and check out some additional nuggets that can help you evaluation your own webcasting program. 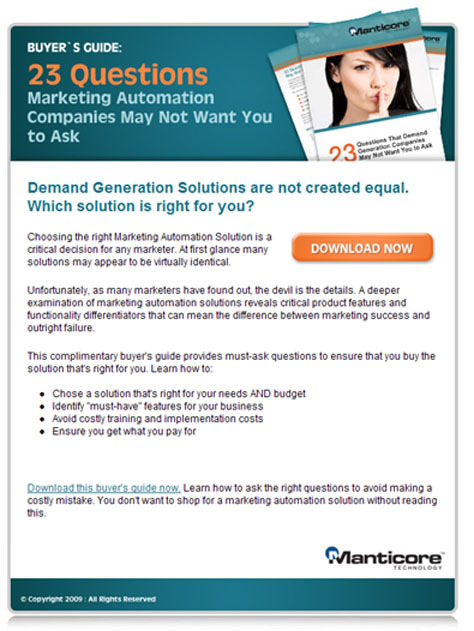 When talking with lead nurturing and marketing automation vendors they all make it seem very easy. You setup a campaign, define the nurturing stages, and even add some points to different interactions to score the lead and customize the nurturing experience. Then with all the triggers in place, sit back and watch the software do the job of sending the right message to the right prospect at the right time. Wow, it’s magical! Yes, except for one little detail. Who’s going to write all that new content? Do you have the staff to do it? Will you have to outsource? Do you even know what kind of content you need for each nurturing stage? Yup, it is more complicated when you get to the implementation phase of the program, and that’s where most companies fail. “The tools of the marketing and PR trade have changed. The skills that worked offline to help you buy or beg or bug your way in are the skills of interruption and coercion. Online success comes from thinking like a journalist and a thought leader”. You’d think that everyone would be doing it by now, but that’s not the case. “The difficulty in creating content that will get a recommendation, the one that most companies tend to get wrong, is that they don’t think creatively about how their content can be exciting to the average population”. Ha! That reminds me of what I see when I visit most B2B companies’ websites. We have all been there. You are researching a new product or service and Google points you to a website, one of the key vendors in that space, and you have to read the page twice to really get it what they are trying to say. How is it that your product or service will benefit me? What is that acronym you keep using? How do I get in touch with someone who can explain all of this? In the B2B marketing space this is notorious. Go to a trade show and the situation gets really bad. Trade show booths with slogans and taglines that don’t mean anything and sales brochures that are full of “features” and screenshots but lack detail of how they solve a problem. While I still struggle to write good content, I did find some useful resources online that I hope will also help you out. What has been your main challenge with content marketing? Last week I started an email design gallery containing a series of HTML emails I received. This post is another installment of the “gallery” concept so that you have more designs to review and use in your own creative process. Is good to see what’s out there, what is working and what is not. The emails in these galleries are mostly B2B marketing in nature, but the design principles can be applied to B2C as well. Note: The emails are in no particular order and the senders were selected at random from a variety of emails I get. Click on the images for larger version. What I Like: Small but visible logo on top left identifies the company immediately. Clean header graphic with big and concise title. Short copy. Right side bar with useful links related to the webinar. What I Don’t Like: Copy is a bit too short… I did register for the webinar and missed it but it could have a bit more copy enticing me to go on and watch it on demand. 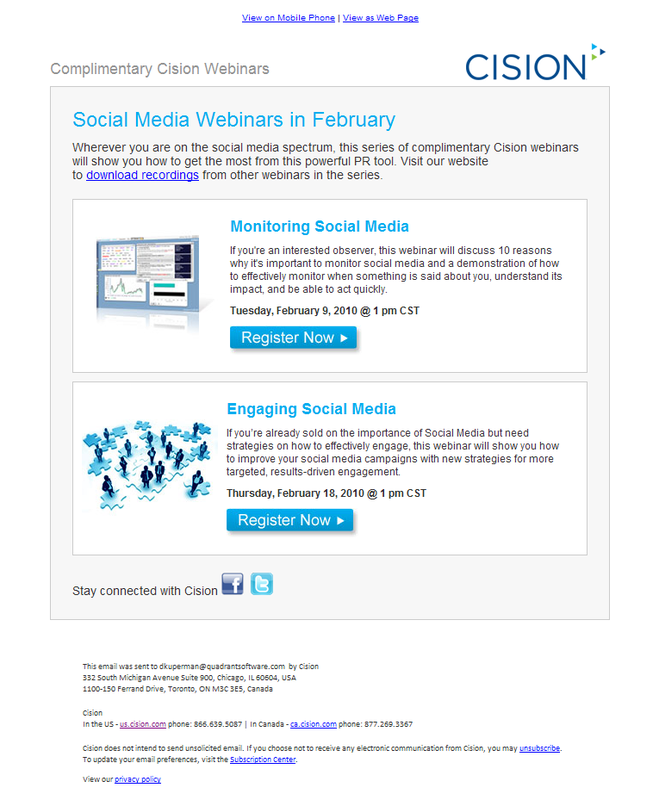 What I Like: Header graphic ties into the title of the webinar. Big blue lead in. Good use of bullets and of bolding of words within the bullets, drawing reader’s attention to them. What I Don’t Like: Three different font sizes in the header graphic. The “sign up today” hyperlinked text at the bottom looks out of place, not sure if because of font size but doesn’t seem to fit within the design. What I Like: Logos for Hertz and Xerox calls attention. 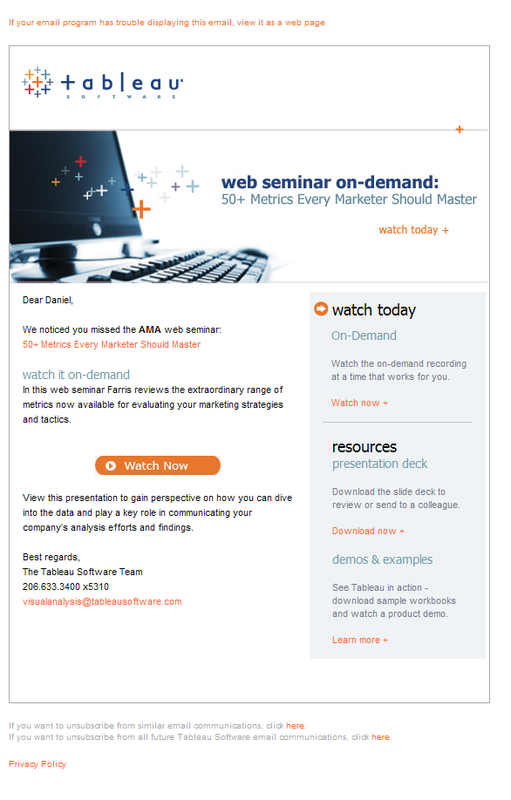 Clear and concise title tells you right away what the subject of the webinar is about. What I Don’t Like: Image used at the header (top left) is one of those generic stock photos that don’t add much to the message. Copy has nothing to do with the Hertz logo. I look at the logo and think it will be something about how Hertz did their e-Invoicing project but the copy doesn’t address that. 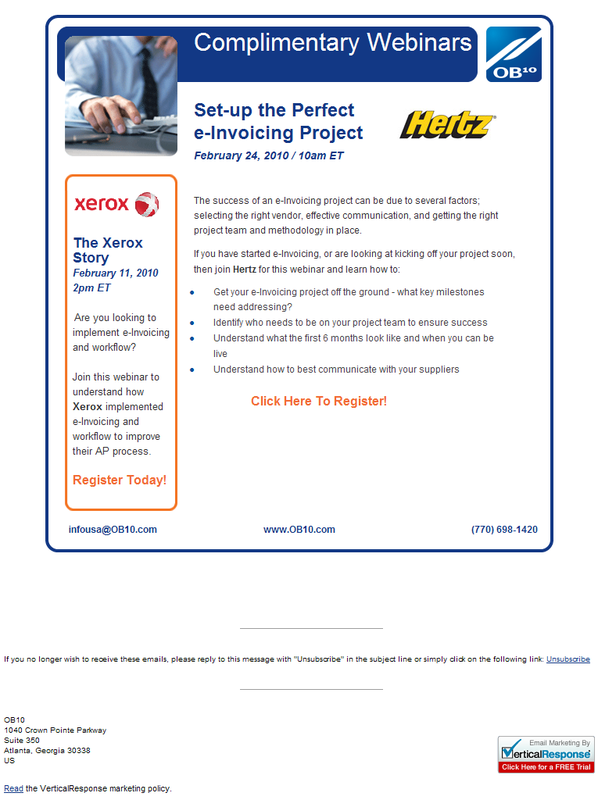 Left side bar with Xerox logo talks about another webinar, which could be confusing. What do you want people to do after all, register for this one or for the other one? What I Like: This email was optimized for Outlook as you can see by the very top of it containing plain text. Sure, it may not look that good when you open it but if you’re using MS Outlook with “preview” or with images off, then you can clearly identify what the email is about. Simple but strong header graphic with webinar topic. Good balance between copy and design elements. What I Don’t Like: The words they use in bold at the bottom are completely opposite to what I would have bolded. What I Like: Big attractive header graphic with compelling title and nice “hero shot” of the buyer’s guide being offered. Compelling lead in. Concise bullet points. What I Don’t Like: Seems to have too much copy, I get discouraged from reading it just by opening the email. Copy takes too long to get to the point of what the buyer’s guide is about. There seems to be a weird white space between the last bullet and the final paragraph. Next I’m thinking about reviewing some email subject lines, because your email design won’t matter if the recipient doesn’t even get to open it! Lead Conversion Rates Demystified… Not! MarketingSherpa recently published a nice chart about lead conversion rates (Note: they give open access to the full article only until Feb 19th). According to their research (147 responses) you need about 10 qualified leads to close one sale. When sharing the chart with my co-workers the responses were varied, from “Great! Now we have the baseline we needed to set our goals!” to “Gee, I guess we should change our lead generation plans” and even “What exactly does this mean?”. What are the sales cycle of the respondents? Those are just the 3 first questions I would ask, followed by a handful more. I did send MarketingSherpa questions trying to get more information and haven’t gotten any response yet. And how about all the other metrics we see out there (a nice post from Market2Lead about Sirius Decisions Lead Waterfall comes to mind)? Should you take MarketingSherpa’s metrics as the de facto guide or combine them with some others? The lesson here is to be very, very careful with data presented to you without any substantiating information. Nice charts abound on the Internet and you can find one to back any story you wish. So before you go start changing your marketing plans, calculating how you compare against the “industry average”, and spend countless hours pondering over the meaning of the data, remember that sometimes it just doesn’t matter. This is the second post finalizing the review of the Inbound Marketing University program from HubSpot. Here I talk about the final 5 classes. If you haven’t done already, check out the review of the first 5 presentations. As Fishkin explained each SEO concept, he made clear that they all need to work together. It doesn’t matter if you have great keywords if you lack the other elements. SEO Tactics: He did a great job at distilling tactics into byte sized advice that we can all use for link building, content creation, and domain names. If you want to get some good insights on effective SEO, check out his presentation and the free articles they have on the SEOmoz website. Veredict: This is a must watch class for those interested in SEO even if you’ve been doing it for a while. Rand’s presentation is engaging and full of great information. If you are not familiar with MarketingExperiments, than you should immediately bookmark their website: http://www.marketingexperiments.com. They always have great content based on lots of testing they’ve done and publish their results frequently. Since I’ve seen their reports and webinars in the past, the presentation about calls to action and landing pages was more of a refresher. Having said that, Jeanne’s presentation is a great starting point for those that have not seen their reports and want great actionable items for improving their landing pages. The best take away from the presentation is their conversion formula: C = 4m+3v+2(i-f)-2a. Rather than being a formula that you need to solve, it is supposed to give you insights on how to create a landing page with higher probability of converting visitors. To get more insight into the formula and how it works, after watching the presentation, check out some of their website design case studies. Veredict: Those new to Marketing Experiments are in for a treat. If you are familiar with them, not much new material. 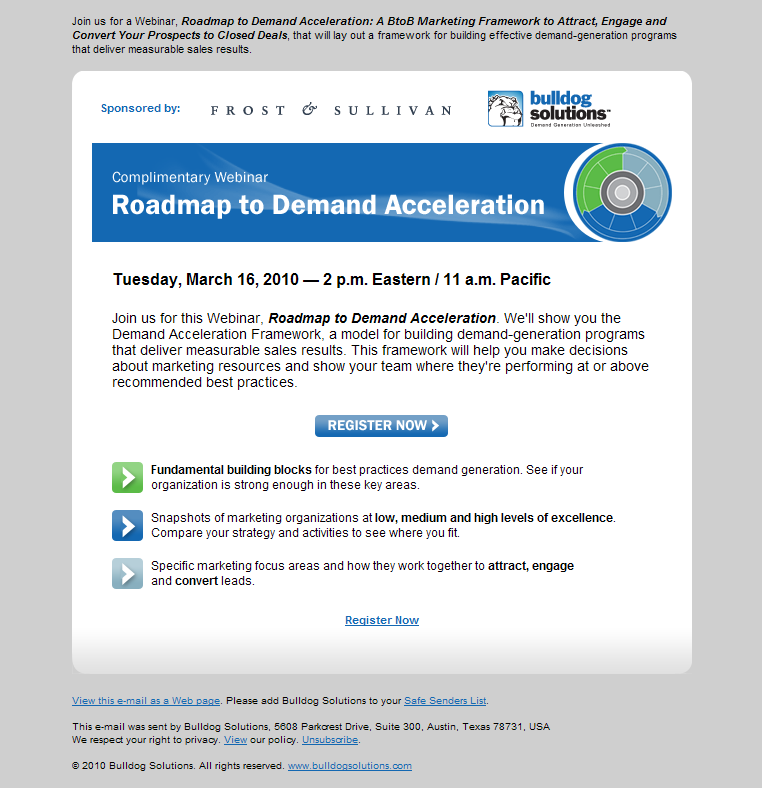 The Lead Nurturing presentation followed the same format I had seen before from previous webinars presented by Brian Carroll, presenting the case for why would you want to “nurture” your leads. While the decision on whether to nurture or pass leads directly to sales will vary based on your own industry and experience, the concept is a powerful one. Veredict: Nothing new, but good solid concepts that marketers need to bring up to the sales management and come with an action plan. This presentation should have been titled Email Marketing 101. So if you need to get up to speed on why you should do email marketing, and the basics behind that, you will find out by watching this class, otherwise just skip it. Veredict: Email marketing basics with a good intro for the novice, but lacking specific tips for the experienced email marketer. Other resources that will give you more insights into doing effective email marketing are MarketingSherpa and Marketing Experiments. In this class Marshall takes you through a tour of web analytics and how to track and measure your efforts related to social media, web, and more. Besides giving you an overview of how web analytics work, he dives into some specific examples of how to understand the data you are getting from the analytics tool. Veredict: Great introduction to web analytics and good tips on different types of analyzes makes this presentation worth watching with a notepad to take notes. While I didn’t expect outstanding material from a free course, some of the classes were really great and worth watching again. The Inbound Marketing University calls itself a “marketing retraining program” and I guess that if you really have not been involved with online marketing up until now, it could be a great eye opener. For those that have been around online marketing for a while is a good refresher but nothing spectacular. I still suggest checking it out because nothing can beat free training.